Brett Gardner and Matt Holliday homered, Masahiro Tanaka won his fifth consecutive start, and the New York Yankees shook off a long game and a short night's sleep, beating the Cincinnati Reds 10-4 on Monday for their sixth victory in a row. The Yankees have the best record in the majors at 21-9 and are 12 games over .500 for the first time since the end of the 2015 season. Their biggest challenge was overcoming the fatigue from an 18-inning, 5-4 win at Wrigley Field early Monday. The Yankees didn't land in the Cincinnati area until 5:08 a.m., and the sun was up when some of them finally fell asleep. Players sipped caffeinated drinks and yawned in the clubhouse pregame. Tanaka (5-1) gave them what they needed after their all-nighter, going seven innings on 112 pitches to rest the bullpen. He allowed four runs - Joey Votto drove in three with a single and a homer - while ending the Reds' five-game winning streak. Gary Sanchez got the Yankees going with his bases-loaded single in the first off Rookie Davis (1-2), a former Yankees prospect. Didi Gregorius also drove in a pair off Davis, who went to the Reds in the trade for closer Aroldis Chapman after the 2015 season. 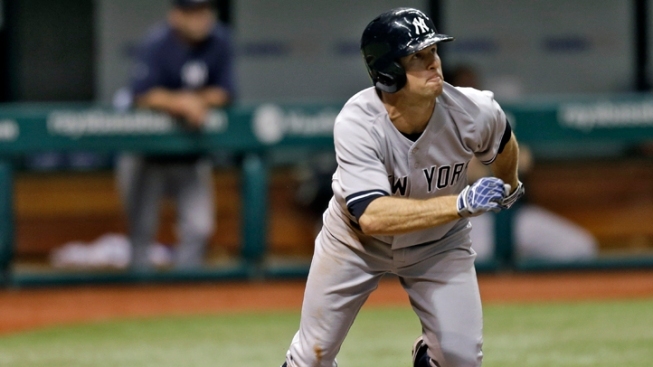 Gardner and Holliday connected in the eighth inning as the Yankees pulled away. There were some sloppy moments for the AL East leaders. The Yankees committed a pair of errors in the infield and had a runner thrown out at second base while tagging on a flyout. Manager Joe Girardi gave Aaron Judge and Starlin Castro a day out of the starting lineup, and he'll give a couple more players some rest on Tuesday to help them fully recover from the 6-hour, 5-minute game in Chicago. The Yankees called up RH Chad Green as insurance for their bullpen. Green's scheduled start at Triple-A was rained out on Sunday, so he was available to throw a lot of innings. Right-handers Luis Cessa and Bryan Mitchell haven't spent 10 days in the minors since they were optioned, so they can't be recalled except in case of an injury. Outfielder Rob Refsnyder was optioned to Scranton/Wilkes-Barre. Yankees: Girardi said Judge has some soreness from diving for balls, but he's expected back in the lineup on Tuesday. Reds: LH Brandon Finnegan started playing catch over the weekend but isn't yet ready to throw off a mound. He has been on the DL since April 16 with a strained pitching shoulder. Yankees: CC Sabathia makes his first start against the Red since 2012. Two of his three career homers have come against Cincinnati: off Elizardo Ramirez at Great American Ball Park in 2005 and off Homer Bailey in 2008 at Miller Park. Reds: Tim Adleman makes his first career appearance against the Yankees. He gave up two runs in six innings of a 4-2 win over Pittsburgh on Thursday.